Our oak fermented honey Saison. Batch 3 was a bit disappointing, but 1 and 2 were truly excellent. Thanks goes out to larryi86 for this brew. Poured into a tulip a pretty nice very slight hazy pale yellow color, pretty nice carbonation, with a pretty nice thick/creamy/fizzy small white head, which also leaves some sticky lacing behind. The nose is malty, yeasty, funky, lemony, slight oak note, slight spice. 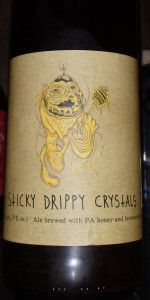 The taste is also pretty nice, malty, yeasty, nice touch of oak, nice funk, lemons, slight oak/spice. Medium body, ABV hidden very nicely, with a nice little dry/bitter finish. Overall, a pretty tasty brew. Thanks Larry!